I started last June 2012. It's been more than a year since then and I honestly couldn't be happier! I love interacting with anyone who reads, so talking to readers, bloggers, and authors, is something that I really love doing. Anything YA (but I do tend to review contemporary and paranormal books more), and recently, I've been featuring more and more NA novels. Ooooh tough one - I have a lot! The Harry Potter series, the Vampire Academy series (I adore Richelle with every fiber of my being), Easy by Tammara Webber, You Look Different in Real Life by Jennifer Castle... Yup, if I don't stop now, I don't think I will. Meeting people who share the passion I have towards books and reading itself, definitely. Through book blogging, I've met a whole community of fellow bloggers here in the Philippines, and they've made my entire blogging experience all that much fulfilling! *Waves* Also, reading and blogging are such huge parts of my life, and getting to share these parts of myself with all of my fellow bloggers - be they be Filipino or not - has made me all that much happier and content. Bookagram: Photograph your fave read in a funny place. I love cooking magazines! I have a shelf in my kitchen that's for my recipe books and cooking magazines. I'm not a big reader of magazines, so my choice was limited. I used to love reading magazine but now I just don't really care. Oh I've never read cooking magazine before, guess I'll check it out since I like trying new recipes. I have to admit to reading people occasionally when my wife picks it up in line at the store. I haven't found a cooking magazine I like consistently. Usually if I see something on the cover that looks good I will pick it up. Just stopping by to say hi. Have a great weekend. My parents usually have one or two cooking magazines laying around as we love getting new recipes to try and pretend we are "gourmet". Have a great weekend Alison! I like browsing cooking magazines but I never buy them. Here's my FF I had no clue about the Dr Who magazine! I will have to tell my obsessed sister! I love the cooking magazines. They always suggest such wonderful seasonal recipes. Thanks for visiting my blog! Old follower but new follower on FB and twitter! Not a magazine reader myself! No idea that there was a Doctor Who one! Frog hopping! LOL. I sometimes browse food magazines but I'm more into food blogs. I used to enjoy looking at cooking magazines. Bu then the pics make me hungry and I can't cook.....so then I'd just get depressed LOL ;) Happy Friday!! hopping by...love your feature this week! I quick hello from a new (bloglovin) follower! 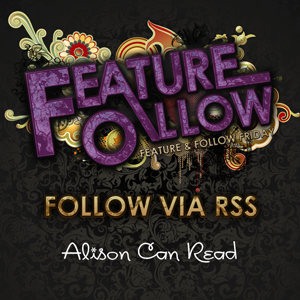 This is my first time at the Follow Friday and I'm hoping to meet lots of other book bloggers and feed my reader. Have a good weekend! I love cooking magazines! Always get a few of them. I used to get Eating Well magazine. I like to peak in US weekly sometimes, too. I didn't know you're a vegetarian, Alison. Three friends of mine are, too. They make the yummiest food ever, and when I'm with them, I always get to try new things. I like cooking and fashion magazines. I am really curious about this Doctor Who. A lot of bloggers seemed to be obsessed with him. Hahaha.